I was livingin Menton, France, which is directly below the ley-lines between the South-East of France and the North-West of Italy. These particular ley-lines appear as great massive rock ridges. But if you look closer at these ridges you will see the faces and bodies of great dragons. 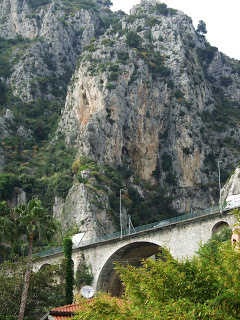 These rock ridges exist between Italy all the way to Monaco at the Mediterranean Sea. The land here has been a fertile ground for citrus, olive, palm trees and many semi-tropical plants. There is a fairytale from the island of Sardinia. This story speaks about the riches of the ley-lines. There once was a witch named Lughia Rajosa. She lived on the ley lines and amongst the standing stones. She spun with a magical distaff called Rocca fatata, the rocks of fate. She guarded the wealth of the land that took the form of thousands of jars of grains, oil, honey and herds of animals. Men would try to steel her wealth when she slept. Finally one day, someone took her distaff and burnt it in a great oven. She was so saddened, she wanted to cry but did not know how since she had never cried. Lughia transformed herself into thousands of insects known as the cicada. We can still hear the cries of the cicadas, reminding us of Lughia loss. The cicadas represent a sacred symbol here in the South of France. We can hear their song on warm nights during the spring and summer. This fairytale of Sardinia carries a thread of truth for all of us no matter where we live. A heavy veil has come between the Spirit of the Land and the people of the Earth. The Goddess’s magical distaff was burned just as many ancient records that gave the understanding of how to live with the land in harmony. Man used the wealth of the land without respecting the Laws of Mother Nature. The natural ley-line power of this Earth and its secrets has been forgotton. The fertility of the land is dying in the climate of our modern world. The ley-lines are also called the dragon-lines. They are the power grid of the earth. You might remember fairytales about dragons who live in rock caverns that have great treasures of riches and wealth. This natural earth power can be used for good or bad, because it is about power, not necessarily wisdom. This dragon power resides a very short walk from my house is. The dragon lines in this area have many ley-lines coming together in one place. I have found an area where two dragon-lines have been cut at the head. Where there was once the heads of ley-lines is now an old underground World War II bunker and a bridge. Dragon-lines always come as pairs both male and female. This area has several ley-lines coming together that meet the sea. I have notice that a very successful store is also built right below a different dragon-line. This store is a million dollar business. Their claim to wealth is the selling of tobacco and alcohol at discount prices. The store has many customers and lines of people waiting for the drugs of their choice. Monaco is another example of great ley-line energies meeting the sea. This small country has beautiful gardens, hotels and villas, but gambling is the source of much of its wealth. What I have found interesting in both of these ley-line areas is: that the negative vice of man are how the power of the ley-line energy is unconsciously manifested. Both areas contain million-dollar business, but the wealth in both these cases is slowly draining the life force of people. I have noticed that I have learned certain lessons here while personally living close-by the ley-lines and the sea. It has been a place of emotional initiations. I have been asked to clean my own lower nature and transform my own inner nagas into inner understanding and wisdom. The natural power of the sea and the earth have been powerful allies in my own inner discoveries. A few days before the New Moon I found a dead cicada’s body on the road. I thought about the good witch Lughia and how her story needs to be told. Today I stood below the two dragon-lines whose heads were cut in the name of modern progress. A beautiful clear stream still flows between these sacred ley-lines, which runs into the Sea. I poured my milk and honey with the greatest respect. I thought we need to use our head and our discernment when working with places of power otherwise that power will only destroy and hurt us and others in the end. is connected to the bridge.